Oh girls all around, are you in for a treat this month! Elizabeth as our Kitchen of the Month came across the most wonderful book in her inlaws kitchen, plucked it from the shelf and couldn't stop reading. She is not the first to recognize the enticing stories and recipes in it; David Lebovitz sang the praise here. The book is called Auberge of the Flowering Hearth..(charming title already) in which the almost blind author spins a tale of an auberge in the French Alps, where the cooking and living follows the seasons, and the hospitality of the two female owners. The recipe Elizabeth chose to make is a walnut bread, checked against Carol Field's Italian Baker. Oh and per Elizabeth's suggestion... do toast the walnuts! Toast some more because if you are like me you need the extra to snack on. Walnuts: In the morning of the day you plan to bake the bread, spread the walnut halves in a single layer on a cookie sheet and toast them in a 400F oven for 8-10 minutes. Watch them carefully so they don’t burn! They’re done just at the moment you begin to smell them. Set aside 200g (2 c) onto a plate to cool. Using a very sharp knife, finely chop the other 53g to produce about 2/3 cup. Mixing the dough: Pour just-boiled water into a large mixing bowl. Whisk in milk powder. Immediately add butter, honey, salt and powdered ginger and whisk until the butter has melted and the honey is incorporated. Add flours, wheat germ and finely chopped walnuts (de Groot suggests grating them(!)) on top of one side of the large bowl. Warm the water for rehydrating the yeast to around 98F, a little over body temperature. Or are you allergic to a thermometer? Heat it until it’s the temperature safe to feed to a baby: a few drops on the inside of your wrist feels warm but not hot. If it’s too hot, add cold water. (Tap water is okay, but pleasedo NOT use water from the hot-water tap! You don’t know how long things other than water have been festering in the bottom of that tank.) Pour the warmed water into a small bowl and add the yeast. Whisk until the yeast has dissolved. Check to make sure that the milk mixture is not above body temperature (do the baby-bottle test on the inside of your wrist again) and then add the yeasted water to the milk mixture. Stir everything together with a wooden spoon to created a rough dough. Kneading: Knead in the bowl (or use your electric mixer’s instructions for kneading) until the dough is smooth, “elastic and no longer sticky”. Proofing: Cover the bowl with a plate and allow to proof in a draft-free area (oven with only the light turned on is ideal) until the dough has doubled. Prepare the pans: Cover cookie sheets with parchment paper. Walnuts and Shaping: Turn dough out onto a lightly floured board and divide in two. Roll each piece into a ball. Cover with a clean tea towel and allow to rest for 20 minutes. After their rest, flatten each ball into a disc and even divide the rest of the walnut halves on top, “pressing the nuts in slightly”, then roll each piece of dough to form a log. Joining the ends to make a ring, place each log seam side down on the parchment paper. Cover with a tea towel and allow to rise in a draft-free area until the rings have almost doubled. Baking: Preheat oven to 375F. Just before putting the bread in the oven, spray the tops liberally with water. Put the bread into the oven and immediately turn the thermostat down to 350F. After 35 minutes, brush the tops of the loaves with milk or cream (de Groot suggests using an egg-yolk whisked with milk to create this glaze) and continue baking for about 10 more minutes until the loaves are nicely browned and have reached an internal temperature between 200F and 210F (the bread sounds hollow when knuckle-rapped on the bottom). Remove the bread from the oven. Don’t even think about touching that knife!! Cooling and Finishing: Allow the bread to completely cool on a footed rack before cutting into it. It’s still baking inside! Of course you may want to serve warm bread: reheat it after it has cooled completely. To reheat and/or rejuvenate UNsliced bread, turn the oven to 400F for 5 minutes or so. Turn the oven OFF. Put the bread in the hot oven for ten minutes. - I completely forgot to fold more walnuts in the dough, nor did I put any on top. Next time I will! This kind of bread reminds me why I bake bread. It smells wonderful, lovely thin crispy crust, very flavorful. You just need butter. Or soup. Or thin slices of dry cured ham. Or like I did this morning with the heel of the bread a small wedge of left over french cheese. We had one of the loaves for dinner last night, with mustard mushroom cream soup and a roasted zucchini/egg plant salad. Yum! Elizabeth is your host this month. Bake this Auberge Walnut Bread according to the recipe and post it on your blog before the 29th of this month. Please make sure you mention BBB March 2016 in the subject line and link to this BBB post in your own blog post. If you don't have a blog do not hesitate to bake and email Elizabeth with a pic and your experience. Details re email over on Elizabeth's blog, scroll down for all the info you need to become a Buddy Baker and receive your Buddy Badge! 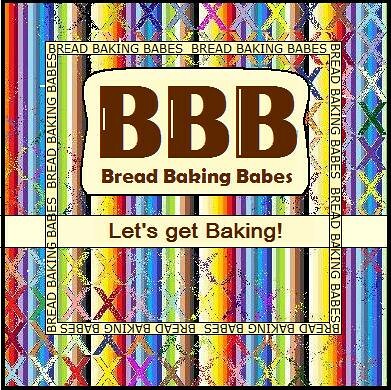 She will then send you a BBB badge for this bread that you can then add to your post on your blog. *Gasp* Yours turned out SO beautiful!! Gorgeous loaf Karen! The walnuts do give the bread such an amazing flavor. Love all of your toppings! It looks perfect!! I'm so glad you and your family like the bread! What beautiful slashing, especially on the loaf that got the milk wash half way through! And you're right, it's important to toast extra walnuts. I almost had to toast more walnuts before I had managed to shape the bread because someone kept asking if he could eat just one more walnut. And good idea to toast the walnuts in a dry skillet. You really have better control that way, don't you? Karen, your loves look fabulous! That caramel coloring really gives it a beautiful rustic appeal. I almost did the round shape but opted for the ring instead. I think this bread would look good in any way, shape or fashion. I'm glad it wasn't just me that ate a lot of/some of the walnuts before they were in the bread, toasted nuts are really addictive! Your loaves are both gorgeous!! ;-) Untoasted I love walnut but toasted ... let's just say I tripled the amount and toasted them or there would never have been enough. Yes this is glorious walnut bread.